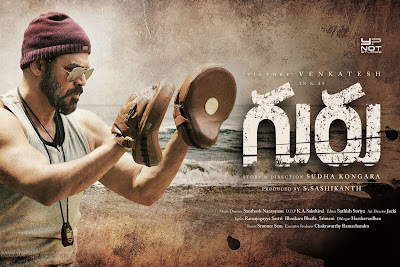 Guru (Teacher) - A story with more focus on love and emotion than on sport and dedication; this supposedly sports drama film has more drama than required which dilutes the punch. In comparison with recent films of same genre, this attempt does not elevate the technique of the sport nor the achievements in it except for a not so compatible analogy of an infamous genocidal ruler's warfare. Moreover, it fails to explain why the path to success in a/any career especially for women has to involve implicit and illicit favours. When a coach is falsely charged and faces a committee, why not the actual culprit (another coach) be charged and presented in-front of the committee? On such a screenplay, one can only pity. Also, over the years even the accomplishments or at-least efforts of the largely frustrated protagonist are not portrayed properly except doing 'jingdi' and eating 'tangdi'. At the beginning of the film, the director thanks her 'Guru' (teacher/mentor) who made a film with same name (Guru) a decade ago. However, of-late even his movies are a setback and might make him go back to a 'Guru' to get back on track. It's no wonder that his assistant, still naive in this field; would need more time to have a good yield.